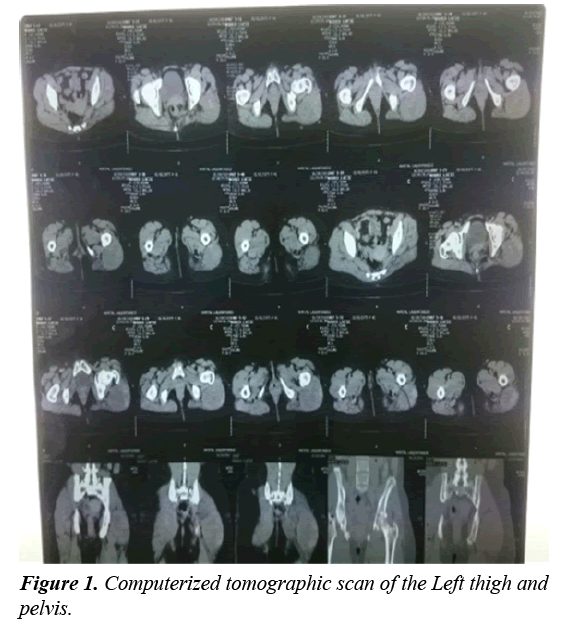 The relevance of the margin of excision in a rare benign tumour: a case report of recurrent myxoma of the gluteal muscle in a resource limited setting. Background: Myxomas are benign neoplasms derived from connective tissue which can be found within large muscle groups. The most frequent location of intramuscular myxoma is the thigh muscles. These tumours often grow locally without distant metastases and may recur if not properly excised with a good margin of excision. Thus, the aim of this case is to illustrate the relevance, consequence and solution of a poorly excised intramuscular myxoma. Case presentation: A 41 year old African female who presented at our surgical unit, following referral for excision of a painless left gluteal mass. Physical examination revealed a lateral left buttock mass, measuring 8 cm by 6 cm, firm, non-tender and slightly. Computerized Tomography (CT) scan showed a homogenous mass of the gluteal muscle and histopathological studies revealed an intramuscular myxoma. Management was by surgical excision with imprecise margin of excision. Two months following surgery, the mass recurred with similar symptoms necessitating a second excision but this time with a 2 cm surgical margin of and a 2nd biopsy which reaffirm an intramuscular myxoma. The patient was then placed on analgesics and physiotherapy following surgery. No recurrence was noted after this. Conclusion: Myxomas are a rare group of benign neoplasm. Diagnosis is only confirmed by biopsy after excision and management is essentially by thorough surgical excision with a wide margin of excision without which there is a chance of recurrence. We therefore recommend thorough surgical excision of intramuscular myxomas with at least a 2 cm surgical margin in order to prevent recurrence. Myxoma, Neoplasm, Recurrent, Surgical margin. Intramuscular myxoma is an uncommon benign tumour of the soft tissue, mostly occurring within the skeletal muscles of the body. They were first described by Stout in 1948 and the most frequent location of intramuscular myxomas is in the thigh muscles followed by the buttocks, shoulder and arm. They are generally poorly circumscribed, usually merges with surrounding muscles and they generally do not recur. The incidence is one in a million population per year  and is higher in women aged 40-70 years . The average size of diagnosed lesions ranges between 1.5 and 17 cm in diameter . Risk factors for Intramuscular Myxoma have not been identified however, the following conditions are known to be associated with intramuscular myxomas: Mazabraud’s syndrome; McCune-Albright’s syndrome (a bone-related genetic disorder) . The basic treatment of this type of neoplasm is radical removal of the whole lesion. In this case report we present a patient diagnosed and treated for a tumour diagnosed histologically as intramuscular myxoma which recurred. Thus, our aim to bring out the treatment challenges of intramuscular myxoma in a resource limited setting. We also want to show that, myxomas can recur if not properly managed. This is the case of a 41 year old female housewife of black ethnicity referred by an oncologist to the surgical unit of a district hospital for surgical excision of a painless left thigh mass of 1 year duration which started with left lower limb pain associated with cramps and paraethesia. The symptoms later became more intense and led to the development of a left gluteal mass, which prompted oncological consultation. There was no history of trauma, weight loss or any family history of cancer. She is a non-smoker, seronegative for HIV (Human Immunodeficiency Virus) with no history of diabetes or hypertension. Before consultation, the patient was taking Tramadol and Aceclofenac as medications. On physical examination, she was conscious with a heart rate of 75 beats per minute, blood pressure of 128/77 mmHg, temperature of 37.1°C and a respiratory rate of 16 breaths per minute. Her conjunctivae were pink, sclarae anicteric and was not wasted. Her chest and abdominal exams were unremarkable. Examination of the extremities revealed a visible mass of the lateral part of the proximal left thigh, which was non-tender, soft, smooth, incompressible, non-pulsatile, hemispherical, non-erythematuous, not warm, not fluctuant and not attached to underlying overlying skin. CT scan of the left thigh done revealed, a heterogeneous tissue mass of the external muscle compartment of longitudinal growth which developed in the place of the gluteus Maximus, taking contrast persistently, especially later on, measuring about 95 × 71 mm, accompanied by a discrete infiltration of sub-cutaneous tissue (left perineum), but especially a lateral osteolysis of the femoral head on contact. No significant lymph node involvement or even invasion of vascular or nervous axes, no endopelvic extension (Figure 1). Fine needle aspiration cytology (FNAC) of the mass was unremarkable. An open excision biopsy and histopathological studies of involved tissues showed mostly fragments of striated muscles, with a little bit of fibrosis and some mature adipocyte lobules. In two of the tissue fragments there was a proliferation of atypical fusiform cells and spread in a large quantity of myxoid stroma. However, the nonavailability of an electronic database for the storage of patient medical records and data in this resource-limited setting hindered the later retrieval of the histopathological slides. These histopathological findings led to the diagnosis of an intramuscular myxoma of the left buttocks. Other laboratory investigations requested such as, a complete blood count, urea, creatinine, alanine aminotransferase (ALAT) and aspartate aminotransferase (ASAT) were normal. Figure 1: Computerized tomographic scan of the Left thigh and pelvis. The patient was then referred to a surgeon for excision of the mass. During the surgery a tumour with a hard white capsule and gelatinous mucous content was seen after opening up (Figure 2). At the end of the excision a drain was placed in the cavity that was occupied by the tumour and was removed a couple of days later (Figure 3). A specimen of the excised mass was sent again for a second histopathological studies which confirmed the diagnosis of intramuscular myxoma. The patient was then placed on analgesia (Tramadol, Diclofenac. There was no immediate post operatory complication and the patient was discharge 1 week later. 2 months later the mass recurred almost to its previous size most likely as a result of a poor margin of excision during the first surgery and a second surgical excision was performed (Radical excision with parts of surrounding tissues was done) (Figure 4). Another histopathological study confirmed the diagnosis of an intramuscular myxoma. There patient was later discharges 2 weeks later and no recurrence was further been reported. Figure 2: Intramuscular myxoma of the left gluteus when cut open. 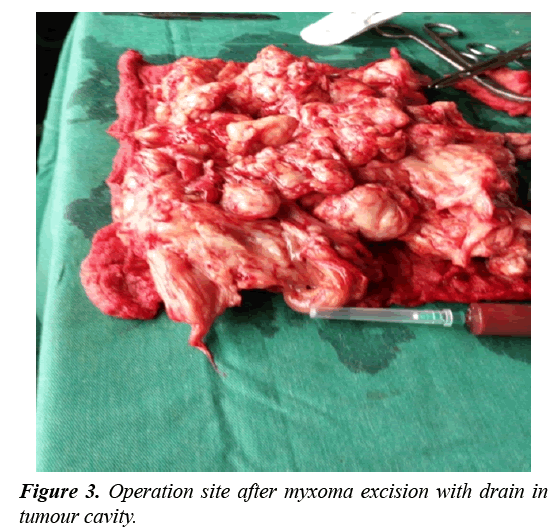 Figure 3: Operation site after myxoma excision with drain in tumour cavity. 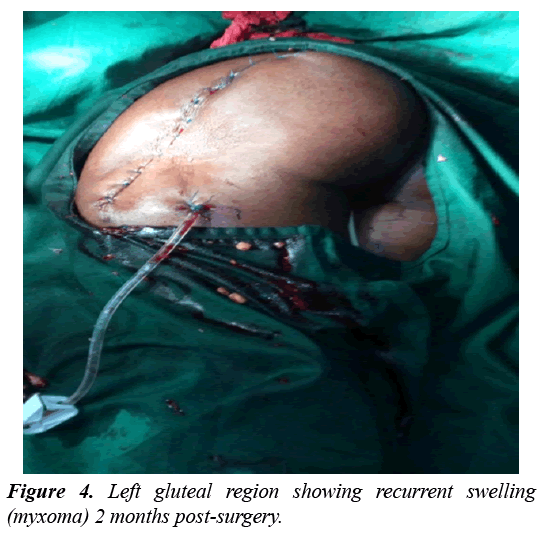 Figure 4: Left gluteal region showing recurrent swelling (myxoma) 2 months post-surgery. Intramuscular myxoma is a rare benign tumour of the musculoskeletal system with an incidence ranging from 0.1 to 0.13 per 100,000. It is common in the 5th and 6th decade of life. There is a slight female predominance . The tumour may occur in isolation or in association with fibrous dysplasia or Albright syndrome . When multiple, and are associated with fibrous dysplasia, they are called Mazabraud’s syndrome . Intramuscular myxomas occur in various skeletal muscles groups, the most frequent being the thigh 51%. Other locations include the arm muscles (9%), calf muscles (7%) and buttock muscles (7%) as in our case . This lesion clinically most often presents with pains as was the case with this patient due to constant slow growth with resultant stretch and pressure on the surrounding tissue and it’s the occurrence of that pain that draws the attention to the lesion and encourages further diagnostics . In literature, pain is described as the first symptom of the tumour which is observed in 6-34% of patients . In the described case the patient began experiencing pain before the swelling started and it was the former that brought the lesion to notice. In the face of any swelling like in this case, appropriate investigations need to be carried out, notably Imaging and biopsy. In the case of an intramuscular myxoma of the buttocks, appropriate imaging techniques include Ultrasound, CT and Magnetic Resonance (MRI) scans. On ultrasound, the intramuscular myxoma appears as a hypoechoic lesion with a well-defined margin. Anechoic cystic foci may be present. On CT scan, intramuscular myxoma usually presents as a well demarcated homogeneous low density lesion within the skeletal muscle. On MRI scan, the lesion usually appears as low signal intensity on T1 weighted images and high signal intensity on T2 weighted gradient echo or STIR images . FNAC is usually not contributory, magnetic resonance imaging (MRI) will show a lesion within the muscle, which has fluid signal intensities, fatty tissue capsule and T2 hyperintence signal from surrounding muscle . X-ray is usually normal or rarely makes the lesion within soft tissues visible . The most precise imaging technique for the diagnosis of an intramuscular myxoma is magnetic resonance imaging (MRI) which wasn’t done in our case due to financial constraints . However a fine needle aspiration biopsy done was unremarkable, CT scan showed a heterogenous tissue mass of the external muscle compartment of longitudinal growth which developed in the place of the gluteus maximus, taking contrast persistently especially later on, measuring 95 × 71 mm accompanied by a discrete infiltration of sub- cutaneous tissue (left perineum), but especially a lateral osteolysis of the femoral head on contact. Non-significant lymph node involvement or even invasion of vascular or nervous axes, X-ray of the left thigh plus pelvis and an abdominal ultrasound were unremarkable. Histopathological studies was done and a diagnosis of an intramuscular myxoma was made. A histopathological analysis is very important for any mass so as the describe the character of the tumours. A FNAC very often fails to bring diagnosis, hence it is then recommended to carry out a core needle biopsy or an open surgical biopsy for histopathology . In our case a core needle biopsy led to the diagnosis and an open surgical biopsy was later on done which confirmed the diagnosis. After imaging and histopathological diagnostics appropriate treatment is usually required. Since myxomas are benign tumours, which are not capable of forming distant metastasis and the percentage relapse is <10%, radical excision is the recommended management [11-13]. There have been descriptions of relapse after non-radical resection [14,15]. Myxoma group of tumours are capable of penetrating the surrounding tissues therefore in the case of an uncertain macroscopic margin, resection of the surrounding tumour with the surrounding muscles is recommended like in this patient . Thus regardless of the location, surgical resection is the most effective method of treating myxomas. However in this patient, during the first surgery, radical resection was not done, which logically explains why it recurred 2 months after, but a second surgery was done with radical excision and no relapse was noticed. This confirms the fact that a wider margin of excision prevents the recurrence of intramuscular myxomas. Intramuscular myxomas are a group of relatively rare benign neoplasm which usually manifest firstly by the occurrence of pain due to pressure and stretching on surrounding tissues before the occurrence of the swelling. MRI is the imaging of choice, but in resource limited settings a CT scan can be done. This should be followed by a core biopsy for histopathological studies for a correct diagnosis. Resection of the mass is the treatment of choice, but to avoid recurrence radical resection has to be done. The above case amplifies these facts. Stout AP. Myxoma, the tumor of primitive mesenchyme. Ann Surg. 1948;127(4):706-19. Satter ek. Solitary superficial angiomyxoma: an infrequent but distinct soft tissue tumor. J Cutan Pathol. 2009;36(s1):56-9. Miettinen M, Hockerstedt K, Reitamo J, et al. Intramuscular myxoma - A clinicopathological study of twenty-three cases. Am J Clin Pathol. 1985;84(3):265-72. Murphey MD, McRae GA, Fanburg-Smith JC, et al. Imaging of soft-tissue myxoma with emphasis on CT and MR and comparison of radiologic and pathologic findings. Radiology. 2002;225(1):215-24. Yaligod V, Ajay S. Intramuscular myxoma - A rare tumor. J Orthop Case Rep. 2013;3(4):38-41. Logel RJ. Recurrent intramuscular myxoma associated with Albright's syndrome. J Bone Joint Surg Am. 1976;58(4):565-8. Arkadiusz S, Dawid M, Aleksander N. Intramuscular myxoma of the left leg - Case report of the lesion observed for several years. Rep Pract Oncol Radiother. 2011;16(2):71-4. Franz ME. Intramuscular myxoma: A review and follow-up study of 34 cases. Am J Clin Pathol. 1965;43(2):104-13. Papadogeorgakis N, Petsinis V, Nikitakis N, et al. Intramuscular myxoma of the masseter muscle. A case report. Oral Maxillofac Surg. 2009;13(1):37-40. Ireland D, Soule EH, Ivins JC. Myxoma of the somatic soft tissue. Mayo Clin Proc. 1973;48(6):401-10. Kinfblom K. SB, Angerball L. Intramuscular myxoma. Cancer Radiotherapie: Journal de la Societe Francaise de Radiotherapie Oncologique. 1974;34:1737-44. Thomas AM, Salutario M, Melvyn K, et al. Intramuscular myxoma: Radiographic and computed tomographic findings with pathologic correlation. Skeletal Radiol. 1981;7(1):15-9. Luna A, Martinez S, Bossen E. Magnetic resonance imaging of intramuscular myxoma with histological comparison and a review of the literature. Skeletal Radiol. 2005;34(1):19-28. Dawid M, Ewelina G, Anna P, et al. Cases of giant retroperitoneal liposarcomas. Rep Pract Oncol Radiother. 2005;10(3):147-51.